He’s being hailed as a real-life Spider-Man. 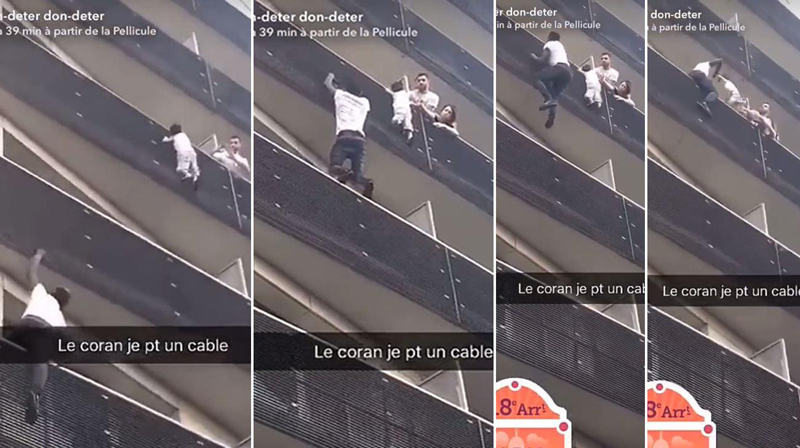 Mamoudou Gassama was caught on video on Saturday climbing a building in Paris to rescue a child who was dangling from a fourth-floor balcony. As the footage above shows, it took Gassama about half a minute to reach the 4-year-old and pull him to safety. Paris Mayor Anne Hidalgo called the 22-year-old hero “Spider-Man of the 18th,” as the rescue happened in the city’s 18th arrondissement (district). On Monday, French President Emmanuel Macron met with Gassama, thanked him, gave him a medal and said he would become a naturalized citizen, per the BBC. The child’s parents weren’t home during the incident. The child’s father was held for questioning while the mother was not in Paris at the time, AFP reported.